PublishDrive recently saw an increase in the number of romance and fantasy authors who signed up to our platform. Self-published authors within these genres frequently use co-authoring as a way to collaborate and share the writing workload. After we had a chance to personally chat with these authors, we learned that they lacked something important: an easy, reliable way to split royalties for co-authors. 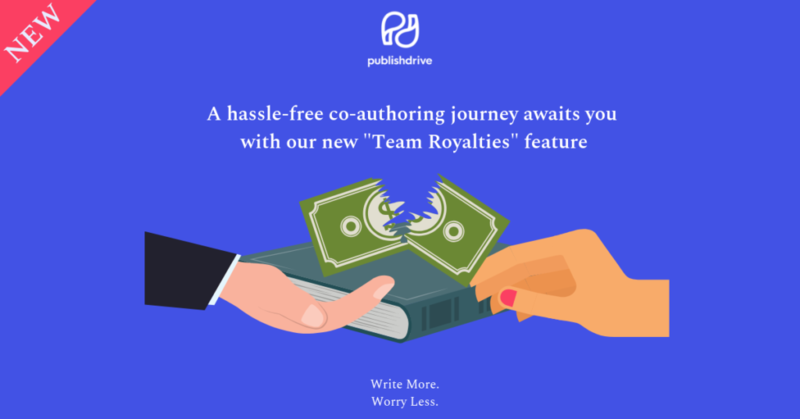 We’re thrilled to announce we’ve released a new feature called Team Royalties, which makes it easy to split royalties between co-authors and other contributors. Learn more about this feature below and discover how easy it is to get started with hassle-free co-authoring. Sign up now and try it! Amazon’s Sponsored Products ads are among the most powerful marketing tools for authors who sell ebooks on Amazon. But the learning curve prevents many authors from ever taking advantage of this robust advertising tool. Months ago, we set out to change that. We’re thrilled to announce that we’ve launched a built-in marketing feature that integrates Amazon advertising for ebooks. Our team invested months of research into finding the best ways to simplify this tool for authors, and we are beyond excited to be the first self-publishing platform to integrate Amazon advertising for ebooks. Now authors can manage global ebook distribution and powerful advertising in a single platform. Until the end of March 2019, beta-testing of this feature is available to all PublishDrive users who sell ebooks on Amazon. This means you can use the tool even if you distribute directly to Amazon rather than going through PublishDrive. Learn more about Sponsored Products ads below and discover how easy it is to get started thanks to our new feature. PublishDrive’s Subscription Pricing Increases Take-Home Royalties for Authors – Learn More in Our Case Study! When we rolled out Subscription Pricing last October, some were hesitant to give it a shot at first. After all, the ability to keep ALL royalties (after the stores’ fee) for a small monthly fee of $100 is unheard of among self-publishing aggregators. But we’re happy to report that it’s working – and authors are loving it. 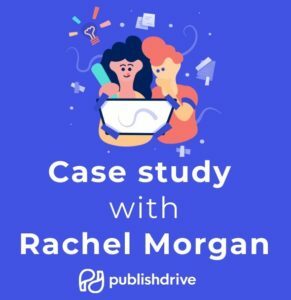 To illustrate the benefits of our new pricing option, we detailed best-selling author Rachel Morgan’s experience after she enrolled in subscription pricing. Explore the summary below to check out the highlights, and download the full case study for FREE here. We released our category recommendation AI last week, and it has been a huge success. Just to recap if you missed it: Savant is able to “read” your content file (epub or docx) upon upload, and guess the most relevant BISAC categories. The task of finding the most relevant BISAC categories is one of the most daunting beginner authors face. There are several hundreds of available options, and it feels like you need to know them all to make a relevant choice. (Read more about BISAC categories here.) This is where Savant comes in the picture. But how does our book categorization AI work? We asked data scientist Mór Kapronczay to explain us the background processes and tell us more about how he built this feature that is truly unique in the ebook market. Congratulations on your achievement! Where did the idea of a book categorization AI come from? Thank you very much! Actually, the idea is not mine: I was hired for this particular job, almost exactly a year ago. It was Róbert Csizmár, our CTO who thought that an AI could be built for this purpose. I agreed and got to work. What is your background? Are you a developer? No, I am in fact an economist, with specialization in empirical finance. I have a Finance & Accounting BA, and a Finance MA with a Specialisation in Investment Analysis from Corvinus University of Budapest. I learned a lot of statistics and econometrics there. In addition to that, I had the opportunity to be a part of Rajk College for Advanced Studies, where I could learn programming and algorithm design, and Machine Learning. I instantly fell in love with both. Our new brand is here! We’re super excited to be releasing several new features (like AI based category suggestion and automatic ebook conversion from docx) and a whole new redesign of our brand this week. As the team’s UX designer, I’d like to share more about our new appearance. Why did we need a new brand? PublishDrive started as a digital tool for global publishers. In 2017 we took part in Google’s Accelerator Program and sharpened our business model which extended our focus to authors. We realized the need to refresh our platform and our brand to get our message out there to authors around the world! It was a huge journey we undertook, but along with working with an awesome design team, MSKTRS, we finally come to the moment we can introduce our new brand. Metadata is very important. We know this. The title, cover image, subtitle and description are crucial because they help your potential readers decide if they want to buy your book or not. But before, you need to ensure that your material can actually meet your possible readers. Your books can be the new Harry Potter, but ultimately be nothing if it doesn’t get in front of an audience – the right audience. The most important way to reach your audience is by providing relevant and specific categories for your book. It’s not the easiest thing to do as these formats and structures (at PublishDrive we use BISAC) are relatively complicated to understand for the first sight (nor the second). Savant’s only job is to read your book and suggest categories. We’re very excited for you to meet him! Google’s Talk to Books: Will it Improve Ebook Sales? I’m all for AI and chatbots – I even designed one! -, but every time I hear ‘use artificial intelligence for book discovery’, I’m sceptical. I didn’t see anything worth looking at since Oyster was closed down, and when I heard that Google has launched Talk to Books, I wasn’t sure what to think. I’m a big fan of everything Google, but most of their new features get shut down within a few months. (Remember Google Buzz?) Anyway, I have tried Google’s free to use AI features a few months back (Google Vision and Natural Language Processing), and I was hoping that Google will soon use these tools to offer better discoverability to the books in their catalogue. Maybe even increase sales? If you are not familiar with Google Books: it is Google’s enormous project, scanning books from all over the world and making the content searchable. The project has not always been everyone’s favourite, but they have recently overcome some copyright challenges, and are working continuously on making information freely available for everyone. It is not only public domain books and legal documents that form Google Books’ catalogue: they have access to the text of all books distributed through Google Play Books as well. Publishers and authors signing up to Google Play Books agree to their books being part of the Google Books project. It doesn’t mean that the whole book will be available on Google Books. It will, however, make the text searchable. Why the long lead in? We have finished last year with quietly unraveling a new feature. PublishDrive is now displaying Amazon ranks directly on the platform, at the level of books. While Amazon Bestseller Ranks are surrounded by mystery, they are very important in following how your books have been doing recently with regards to the industry. But checking the ranks of all of your books in all the different Amazon stores in all categories can be tiring. The new Rankings feature follows your recent ranking in all major Amazon stores your books are sold in. It also creates a handy graph of your book’s journey. What are Amazon Bestseller Ranks good for? For the last few months, I was working on a secret project: teaching and launching our customer service chatbot, Edith. We write a lot about how writers can utilise AI and Natural Language Processing to save time with their marketing, so we thought: let’s try it ourselves! This is why we built Edith, our new customer service superstar: she knows the FAQ better than any of us, has a great sense of humor (well, she has my sense of humor) and gets smarter by the day. This article is on how to build a messenger bot using Dialogflow (API.AI) and how can authorpreneurs use it in their marketing. You can also try the bot (we used the sad and low-functionality WordPress plugin), only under this article. Messenger bots are a great way to engage potential readers and keep your existing readers entertained. This is the third, final part of our series focused on industry disruptors. The first part analysed how AI will automatize much of the marketing, and the second was interested in whether blockchain is here to decentralize distribution and pose a threat to Amazon and Google. In the third part of the series, we are focusing on disruptors once again: how they change distribution and book production processes. There is only a certain number of regular readers, and it seems like traditional publishers and self-publishers are fighting againsteach other to see who is able to get the biggest slice of the pie instead of simply focusing on providing better solutions to the readers. As Richard Nash points out: there are two contrasting tendencies working against each other, both extremely low prices set by Amazon and extremely high prices set by traditional publishers. And this is the point where industry disruptors can come into picture. Can you enter the price competition without compromising on quality? Will you present yourself as a premium service? Today’s biggest question is how to keep your professional integrity and stay on your feet. ©2018 PublishDrive. All Rights Reserved. We are members of the Independent Book Publishers Association. We are members of the Alliance of Independent Authors.